All curriculum subjects at Matthew Gibney are taught in accordance with the Western Australia’s School Curriculum and Authority Standards. These are aligned with the Australian Curriculum. At Matthew Gibney we aim to ensure that the students are competent and confident in using computers to support and enhance their learning. Students have access to a range of technology such as iPads, laptops, desktops, cameras and recording devices. This technology assists us to integrate Information and Communication Technology into all aspects of the curriculum. Interactive Whiteboards (IWB’s) are installed in all classrooms. Interactive TV and Apple TV’s are also used by staff and students. Our school is fully networked, with each classroom containing multiple networked devices. Each week, the students from K-6 are taught Digital Technology lessons in the computer lab. Children at Matthew Gibney enjoy the creative and performing arts through class-based Art, Music and Drama classes and also have opportunities to participate in a broad range of artistic endeavours as part of the co-curricular programme. 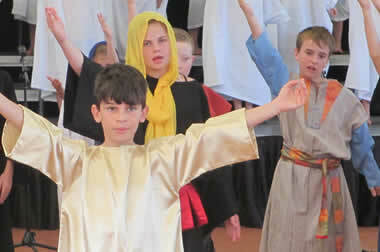 Each year the school is well represented in the Catholic Performing Arts Festival. A private music tutor works at Matthew Gibney, one day per week. This initiative provides specialist music tuition in the keyboard. This is an optional addition at the school for families wishing to involve their children. These sessions are within school hours and are organised on a cyclic timetable to minimise disruption to student learning. This initiative has been well supported by the school community. • Student Leadership Program (Year 6). • Catholic Performing Arts Festival (dance, drama, singing, instruments) at Archdiocesan level. • Strong links with Feeder High Schools, including Galileo Program with La Salle College, Robotics and Virtual Reality with Mazenod College.